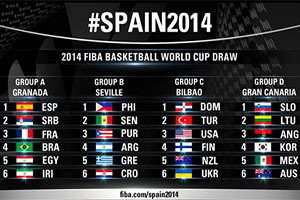 With the FIBA World Cup just about upon us, teams will have their aims and ambitions set in stone. There will be some teams like Spain and Team USA who are gearing up for success at the tournament and who will consider anything less than winning to be a failure. This is the harsh nature of sport, if you are expected to win, and you don’t, you are classed as failing. This isn’t the case for every team at the event though, there will be teams who will be delighted to be at the event, and they are likely to have a more modest set of ambitions for the big summer event. While Spain and USA are looking to win the tournament, South Korea are looking to win one game. This is a modest approach but when you think that the team hasn’t won a game of this nature for close to twenty years, you see why the achievement of winning just one game would be something worth celebrating. This is because the team last won a game of this magnitude in 1994 against Canada. This is why there would be a lot of happiness and joy at managing to win just one game during the FIBA World Cup. There is no doubt that the team is an underdog for this event, and the fact that the team hasn’t played too many games against other nations in the warm-up is a concern for some fans. It could be seen that a dispiriting defeat would be damaging to the players but there is a need to get up to speed as quickly as you possibly can. South Korea have been placed into Group D, where they will come up against Lithuania, Mexico, Angola, Slovenia and Australia. While it is likely that if Lithuania and Australia hit top form that the South Korean side could receive a strong defeat, but there are hopes that the games against Angola and Mexico could provide success. For the South Koreans, the prospects of winning against Angola and Mexico are high since both are ranked relatively low in the global standings, at 15th and 24th, respectively. The side faces Angola in their opening game and while Bet365 are making the Angolan side the favourite, it is not as if the odds are completely stacked against the South Korean team. At the time of checking, the odds were listed at 1.44 for Angola and 2.88 for South Korea. These are far from being the toughest odds on offer, with the match-cup between Lithuania and Mexico showcasing the difference in odds. Bet365 is listing Lithuania at 1.01 while Mexico are listed as 17.00 for the win. With these odds in mind, you can see why South Korea are not ruling out the chances of succeeding in a game or two at this summer’s big event. If a team manages to pick up two wins in the opening round, they will make their way through to the second round, which would undoubtedly be classed as a success for the South Korean side. When you take on board that South Korea have managed to defeat New Zealand in relatively recent games, a team with a similar ranking to Angola and Mexico, this may just be the summer when South Korea break their duck. These two games did see the South Korean side make mistakes and struggle at times, but they dug out wins, which is the only thing that really matters during a World Cup event.